Whether applied to a failed business arrangement or an ancient form of torture, “death by a thousand cuts” signifies a larger outcome that occurs as the cumulative result of multiple smaller events. For the periodicals market, the lingering impact of the Great Recession is one such gash. Libraries receiving a declining percentage of overall university budgets, another. Promotion and tenure systems based upon publication, yet another. Research output evaluation based upon citation metrics—cut. Six percent serials cost inflation each year since 2012—cut, cut, cut. For the last 24 years, the titles of this annual survey have reflected the library journals environment. From “Reality Bites” to “Fracking the Ecosystem,” the articles have detailed the prominent issues in serials at the time of publication, many of which have been with us for decades. 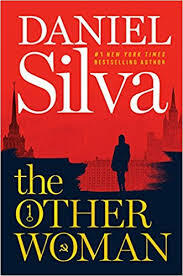 At times the library world seems mired in the equivalent of the story line of the movie Groundhog Day, in which the lead character is trapped in a time loop, destined to repeat the same actions over and over until he makes significant changes in his attitude and, therefore, his situation. The U.S. economy continued to expand in 2017, at a slightly higher pace than it did in 2016. According to the Bureau of Economic Analysis, the U.S. gross domestic product (GDP) increased by 2.3% in 2017 compared to 1.5% in 2016. Total state spending grew moderately in 2017, following a slowdown in FY16. According to the National Association of State Budget Officers (NASBO), states enacted modest appropriation increases in FY18 totaling $12.7 billion across all program areas, compared to $25.8 billion enacted in 2017. The Consumer Price Index (CPI) rose 2.5% over the 12 months ending January 2017. From January 2016 to January 2017, the CPI for All Urban Consumer (CPI-U) rose 2.5%, the largest 12-month increase since March 2012. The Center on Budget and Policy Priorities informs us that in the decade since the Great Recession, state spending on public colleges and universities remained well below historic levels, despite recent increases. Overall state funding for public two- and four-year colleges in the 2017 school year (that is, the school year ending in 2017) was nearly $9 billion below its 2008 level, after adjusting for inflation. The funding decline has contributed to higher tuition and reduced quality on campuses, as colleges have had to balance budgets by reducing faculty, limiting course offerings, and in some cases closing campuses altogether. 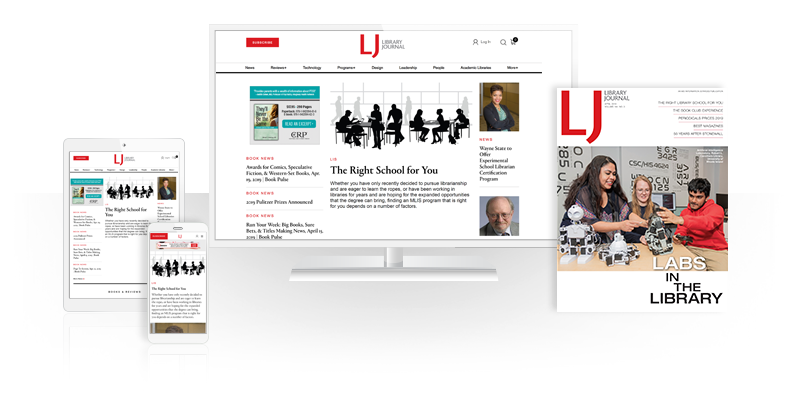 A review of the past three years of LJ’s Budgets and Funding survey of U.S. public libraries shows small budget increases each year. This year’s survey revealed a 2.8% increase in 2017’s total operating budgets, representing continued improvement since the lows of 2008—although down from last year’s gain of 3.4%. Materials budgets rose by an average of 2.5% vs. 2016’s increase of 3.7%. Overall, these numbers represented a flattening of the past few years’ gradual catching up. It is a different situation in academic libraries. The 2016 Association of College and Research Libraries (ACRL) Academic Library Trends and Statistics, published in July 2017, reported that over the past five years, 19% of the 1,525 libraries that responded to the survey experienced decreased funding and 60% had flat budgets. The research advisory firm Outsell reported in October 2017 that the overall 2017 total library content spend was flat when compared to 2016. Per the report, the situation was slightly better in corporate than in the academic, school, and public library markets, but, even there, the average content price increases were greater than budget gains. A study by industry market analysis firm Simba Information agreed that academic library budgets are essentially flat and concluded that overall sales of scientific and technical books and journals decreased by 1.7% in 2016. Journals, which make up nearly half of scientific and technical publishing, are estimated to have decreased by slightly more than 2% in 2016 to $4.8 billion owing to the impact of finite library budgets and currency fluctuation. After adjustment for currency, overall journal sales are believed to be growing at approximately 2% per year. Simba estimates that the number of published articles will increase by 5% annually. The annual white paper of the Publishers Communication Group (PCG) “Library Budget Predictions for 2017” reports similar trends. Working through a telephone survey, PCG interviewed senior librarians at 665 institutional libraries in North America, South America, Europe, Africa, Asia Pacific, and the Middle East. Responses indicate that worldwide overall library serials budgets are expected to increase by only 0.8%; serials budgets in North America are expected to decrease 1.4%. 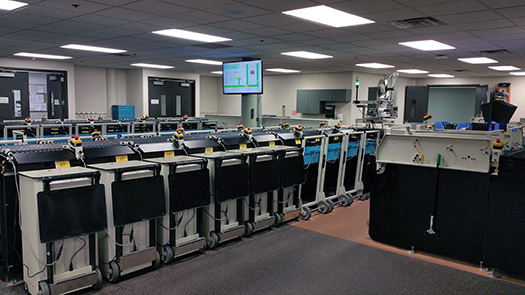 In North American academic libraries, the e-format dominates, with online-only orders comprising 79% of all serial ­expenditures. Overall price increases for titles in EBSCO Publishing’s Masterfile Premier are expected to be in the 5.5% to 6% range. Overall price increases for titles in EBSCO’s Academic Search Complete are expected to be in the 6% range for 2019. NON–U.S. 4,083 60 1,821 62 5.6 1,923 62 ?? The price survey, with the exception of Table 3, uses a print-preferred pricing model based on the standard retail price for the titles in the selected indexes. Print pricing is used for consistency because not all publishers make their online-only pricing publicly available. The index does contain pricing for print plus online and online-only when print rates were not available. Print-only pricing comprises 48% of the data used in these tables, reflecting the overall shift to online and the decline in print. The survey uses a combination of title sets to provide different views of the impact of inflation on libraries. Titles indexed in the Clarivate Analytics (formerly ISI) Arts and Humanities Index, Science Citation Abstracts, and Social Science Citation Index provide data that is useful for large academic libraries. The data from these indexes is presented by individual index as well as in merged format by discipline and country of origin. Electronic format cost data, when available, is included in Table 3. Titles indexed in EBSCO’s Academic Search Complete database are used to represent the titles most commonly held in general academic and large public library collections. Data from EBSCO’s Masterfile Premier is included to provide a data set that would be germane to smaller public and school libraries. In 2016, the study expanded to include approximately 15,400 priced titles indexed by Scopus, creating a larger and statistically more reliable sample. Reflecting a similar pricing trend, the data from the Scopus list increased by 7% for 2018, a higher percentage when compared to previous years. According to Table 1, average prices for science, technology, and medical (STM) serials remain the highest, when compared with prices for serials in other subject areas. Over the 25-year history of this article, Chemistry and Physics have consistently been the two highest cost disciplines. This year’s data reports the average price for chemistry journals as $5,508, closely followed by the $4,792 average cost for physics. There were only slight shifts in relative rankings for subject areas based on the overall average prices for serials. As noted in the analysis of the charts, content from five major publishers—Elsevier, Springer, Wiley, Taylor & Francis, and Sage–continues to represent more than half (54%) of the titles in the merged Clarivate Analytics (formerly ISI) indexes. As well, in Table 2, there was little change in the relative order for the average price per title sorted by country of origin. Since so many serials are priced in U.S. dollars, the exchange rate issues experienced by libraries outside of the United States are not reflected in this table. The average price per title increased from previous years; titles from Ireland continue to have the highest cost per title for those included in the merged Clarivate Analytics indexes. The Netherlands, Singapore, Switzerland, England, United States, Germany, Greece, China, and Australia round out the top ten countries having the highest cost per title in 2018. Table 3: This table examines the titles in the combined Clarivate Analytics Arts and Humanities, Science Citation, and Social Sciences Citation indexes that offer published rates for online formats. As in past years, the data reflects pricing for online-only, print plus free online, and the first tier of any tiered pricing, with the common element being pricing for the online format. Table 3 contains data for 54% of the titles in the full tables. As in Table 1, STM titles are the most expensive, with chemistry titles having the highest average cost of $4,759. The 2018 average cost for this set of titles is $1,483, a 7% increase from the 2017 average price of $1,385. It is important to bear in mind that the individual titles in the data set and associated pricing models reflected by Table 3 change annually, so the increases could be due to changes in the title set as well as actual price changes. What remains consistent is the annual increase falling in the 5% to 6% range and the relative high cost of titles by subject area, with science and technology topping the chart. Once again, we analyzed the rate of price increase for more than 8,600 e-journal packages handled by EBSCO Information Services. For 2018, the average rate of increase was in the 4.7% to 5.3% range, up slightly from the 4.5% to 4.9% in 2017. The journals marketplace is a mature market in which demand and supply are in equilibrium. While the original e-journal big deal pricing model of maintaining the current spend with a publisher plus a pro rata amount to access additional content did expand offerings to libraries, it did not address the underlying funding problems and in many cases made them worse. The growth of Gold Open Access—by which authors, libraries, universities, or funding agencies pay a fee to commercial publishers for the article to be made freely available to all worldwide without additional charge—addressed access to content but compounded budget issues by adding additional costs. According to Simba Information’s report “Open Access Journal Publishing 2016–2020,” the open access (OA) publishing market is estimated to be approximately 3.2% of global 2015 STM and is expected to grow to 4.3% of journal revenue by 2020. Countless hours have been devoted to discussions of how to reconcile library budget realities with Big Deal e-journal packages. 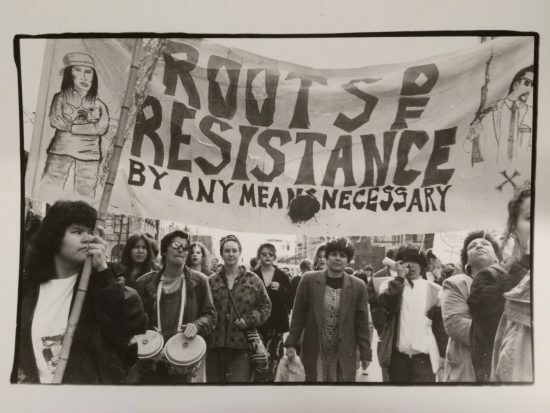 Strategies have ranged from negotiating for lower overall pricing based upon the particular economic circumstance of the library or group to “unbundling” or negotiating for a specific set of journals. The Université de Montréal has reported success using this strategy with at least four major publishers. Some groups negotiate for both pricing and lower article processing charges (APCs). For example, FinELib, the national consortium in Finland, finalized agreements with three publishers within the last year featuring APC discounts ranging from 50% to nearly 88%. However, APCs, no matter the discount, still require funding above the cost of an individual subscription or the price of an e-journal package. A report issued in February 2018 by the European University Association surveying 338 representatives of member higher education institutes and universities found that more than 80% of respondents consider publishing in conventional journals a high priority. The report, “Open Access: 2016–2017 EUA Survey Results,” theorizes that the focus on conventional journal publishing is likely owing to research assessment methods. The survey also found that more than 86% of librarians and 53% of institutional leadership were perceived as being knowledgeable about scientific publishers’ OA policies, but less than a third of researchers were perceived as possessing comparable knowledge. A majority of the responding institutions reported that less than 20% of their peer-reviewed research publications were available via OA. 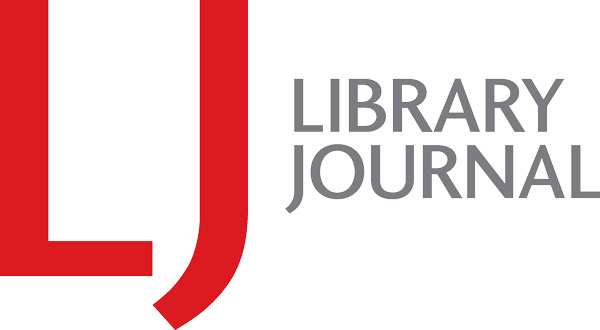 A brief issued also in February by the Canadian Association of Research Libraries, “Responding to Unsustainable Journal Costs,” states that a “key contributing factor to the problem of subscription costs is our reliance on journals metrics as the main means for accessing research quality and impact. The research community tends to focus on publishing in prestige journals because of the widespread use of journal and article-based metrics for research evaluation, especially in the context of promotion and tenure.” As long as this situation continues, the library community will remain in the Groundhog Day loop. There has been little change in 2017 to the serials business models or the market drivers, including continued reliance on traditional evaluation metrics, library budget compression, publisher and vendor consolidation, currency fluctuation, OA, and an unsettled worldwide political climate. The market equilibrium of 6% annual price increase is expected to be the same or slightly higher for 2019. When placed in the context of stagnant library budgets, this level of increase is unsustainable and will likely result in market constraint where scholarly communication as we know it will continue to suffer death by a thousand cuts. Journal price data is important for budget management processes, but price alone is not the sole factor determining value. Some metrics, such as Impact Factor, have become important in assessing value, and similar value metrics will only increase in importance in the future. Improvements in usage data gathering (Counter 4 and 5) and developments in the altmetrics arena may provide even more data that could be used to help make qualitative assessments of the impact of scholarly publishing. Data-based decisions will be crucial as libraries actively manage their information resources. Table 4: Comparison of Average Price of Titles in Clarivate (formerly ISI) Indexes Grouped by Price to Impact Factor, etc. Altmetrics are not yet widely accepted for assessing scholarly materials, so the traditional metrics continue to dominate assessment. This year the survey continues to employ the title and publisher data collected for the article to explore the relationship between prices and metrics used to assess journals such as Impact Factor, Eigenfactor, and Article Influence Score. The relationship between serial prices and numbers of citations also was explored, with interesting results. Impact Factor of a journal is the average number of citations received per paper published in that journal during the two preceding years. The Impact Factor of a journal is calculated by dividing the number of current-year citations to the source items published in that journal during the previous two years. of incoming citations, with citations from highly ranked journals weighted to contribute more to the score than citations from poorly ranked journals. Journals are considered influential if they are cited often by other influential journals. Article Influence Score is determined by the average influence of a journal’s articles over the first five years after publication. It is calculated by dividing a journal’s Eigenfactor score by the number of articles in the journal, normalized as a fraction of all articles in all publications. The mean Article Influence Score is 1.00. A score greater than 1.00 indicates that each article in the journal has above-average influence; a score under 1.00 signals that each article in the journal has below-average influence. The pricing data titles in the merged Clarivate indexes for 2018 were divided into five price bands: $200 or less, $201–$550, $551–$1,075, $1,076–$2,290, and more than $2,290. These bands were selected ensure that the number of titles in each area was reasonably comparable. The average for Impact Factor, Eigenfactor, and Article Influence Score for all titles in a price range was compared to the averages in the other price bands to explore the relationship between quality metrics and journal price. The results are displayed in Table 9 and the chart based on Table 9. Impact Factor and Eigenfactor tended to show an increase with the increase in price, though this increase was not as large as the increase in price. Although there were increases in the metrics for Impact Factor and Eigenfactor, the increases were not comparable to the increase in price, since the average price ($5,196) for the most expensive journals was 85 times higher than the least expensive ($61) journals, while the impact factor only doubled. The price increases for the more moderately priced titles were also lower than the more expensive titles. Higher priced titles do have higher Impact Factors and Eigenfactors, but the increase in the metrics is small when compared to the increase in costs. 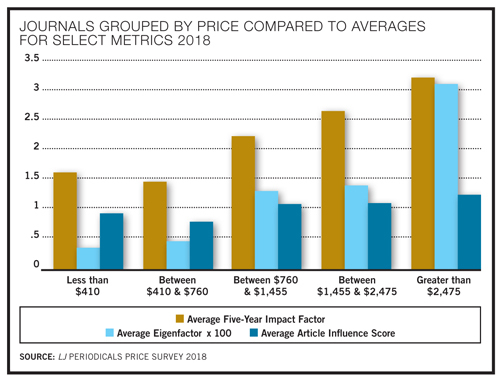 Article Influence Score did not show a strong correlation between higher scores and prices, with the average for titles less than $1,076 showing an average below the mean of 1 (below average influence) and the more expensive titles showing an average of 1.2 (slightly above average ­influence). If the total cost of journals in a price band is divided by the total number of citations, high-priced titles had the highest cost per citation. The ratio of citations to serial costs by subject is reviewed in Table 10. For STM journals, the average prices tend to be high in comparison to other subjects. This scenario changes if the costs are divided by the numbers of citations for the journals. Chemistry has the highest average price for journals but the fourth lowest cost per citation. Journals in chemistry are very expensive, but they are heavily cited. If citations are considered an indicator of value, then chemistry journals, despite high average prices, are high-value journals. Conversely, journals in philosophy, music, and art are relatively cheap but are infrequently cited, so journals in those areas show the highest cost per citation. Based on this set of data, if cost per citation is reviewed by type of publisher, it is not surprising that commercial publishers have higher per citation costs than other types of publishers. Commercial publishers showed a cost per citation of 37¢ (average price $1,987) while university presses showed 18¢ (average price $480), and societal publishers showed 8¢ (average price $1,193).